Stottercliffe Garage can handle your claim from start to finish, ensuring you our personal attention at all times. With over 30 years experience in the motor body repair business. Based in Penistone we are centrally located to conveniently service surrounding areas including Barnsley, Wakefield, Huddersfield and Sheffield. In the case of a non fault accident, Stottercliffe Garage can carry out repairs to your vehicle with the minimum of delay and recover the repair cost from the negligent party. Why use your insurance company when the accident is not your fault. By using our service your no claims discount is not affected and you may not have to pay your excess, plus a courtesy car will be provided if necessary. We will inspect your vehicle, supply a written estimate, arrange for your insurance companies assessor to inspect the damage to your vehicle where necessary and agree a cost for repair with the minimum of delay. 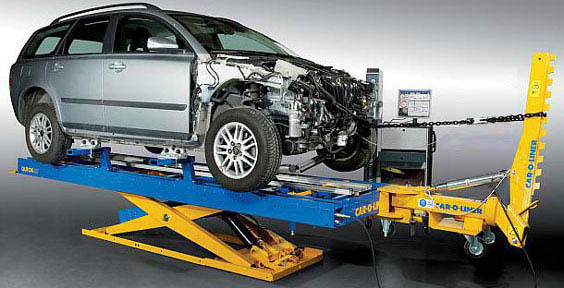 We will carry out removal of damaged panels, stripping down of the vehicle for inspection, perfect realignment of the vehicle using the car-o-liner jig. A check of the critical points and distances of the cars structure, cleaning of new panels and welding them permanently into position. Preparation and coating of the body with anti corrosive primers and sealers, an exact colour match. The application and baking of top coats to produce a perfect high gloss factory finish. The exact fitting of exterior trims, final checks to the wheel alignment to ensure perfect steering and to the bodywork so that they are all back to the manufacturers specification.